Poisoning by counterfeit alcohol kills 42,000 Russians every year, the country's interior minister has said. Rashid Nurgaliyev said bottles of alcohol on sale in Russian shops often contained poisonous liquids, and called the problem a "national tragedy". He also said a significant amount of alcohol imported from other parts of the former Soviet Union was faked. Mr Nurgaliyev has led efforts to crack down on alcoholism in Russia which causes an epidemic of ill-health. Food shops and convenience stores in Russian towns frequently offer a dazzling range of alcoholic drinks, sometimes in very elaborate bottles and packages. But as Russia's interior minister pointed out, what they contain is sometimes not vodka, cognac or wine, but any number of potentially fatal substances. Speaking in the Russian city of Novgorod, the minister said that bottles of White Stork - a rather cheap but once popular brand of cognac - were still on sale, despite the fact that production of it ended years ago. Mr Nurgaliyev also repeated the claims heard from the Russian ministry of health, that much, if not most, of the wine from Georgia and Moldova is counterfeit and potentially harmful. The governments of both those countries are convinced that the Russian ban on their wine, one of their few lucrative exports, is politically motivated, and actually designed to punish them for their pro-Western policies. Whatever the reality behind that, Russia's problem with alcohol remains serious. More than 100 people die every day, having poisoned themselves on counterfeit alcoholic drinks. 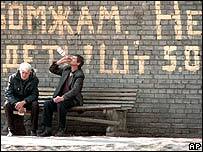 It is estimated that every third Russian man and every seventh Russian woman, is an alcoholic. Mr Nurgaliyev has adopted tougher measures to try to deal with the problem, - encouraging, for example, bans on the sale of alcohol at night, or to minors. But progress has been limited, and Russia's love of the bottle continues to fuel some of the world's highest rates of fatal accidents, premature death, violent crime and domestic violence.